Hello everyone. I'm starting off this week with more creations using my 2 Squared School Kit. I worked all weekend on projects and I finally conquered the kit! I'll be sharing my other projects throughout the week. I'm excited to have a stash of cards and gift packaging for the teachers. So here's what I chose to work with today from the kit. I also created a fun punched file tab garland using the Jenni Bowlin punch and grey cardstock. Let's see what I come up with. I decided to do a set of 3 cards with coordinating envelopes + packaging for today. 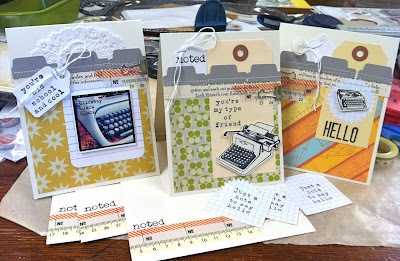 I used the 4 x 4 Studio Calico Elementary patterned papers at their true size. 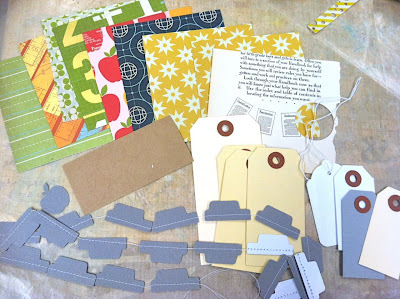 I layered on tags, strips of the old book paper and 3 pieces of the file tab garland. I wanted to add stitching that didn't show through on the insides of the cards so I did all the assembly on the 4 x 4 piece of patterned paper, then did my stitching. For each card I reached for some extra Medium White Tags. Here I used one with the strings stapled to the top of the tag. 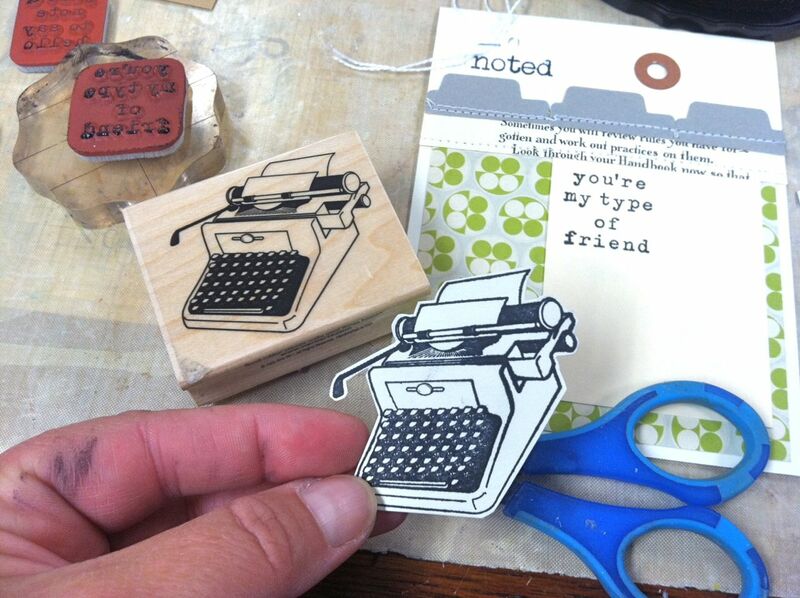 Stamps are from Studio Calico. Here's one I did using the same assembly method as the card above. I used the small index card from the kit and rounded the corners then added one of my small Instagram prints. I also added a piece of a Dainty Doily under the stitched layer. 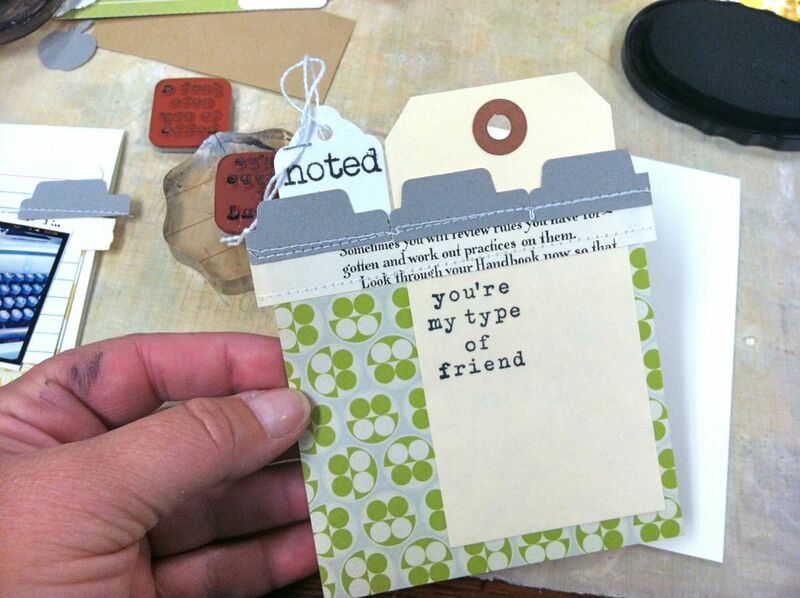 For the Medium White Tag, I used it as the main card sentiment(Hero Arts) with stapling. For my third card I used this fun Retro Typewriter stamp and My Type sentiment from Hero Arts. I stamped the image and cut it out carefully with fine tipped scissors. The Large Manila Tag from the kit is the base for the popped up image. You can see in the photo below how I did the assembly and stitching on the 4 x 4 piece of patterned paper before applying to the cardstock. Speaking of cardstock, I found a great selection with coordinating envelopes to use in my kits. Stay tuned for more information on these kits coming this Fall to my shop. 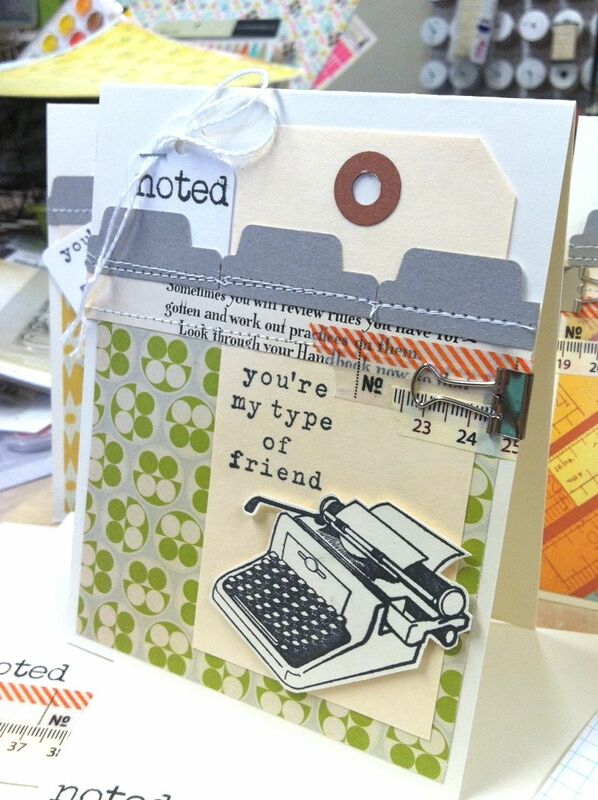 Here's the finished card with the popped up Hero Arts typewriter. 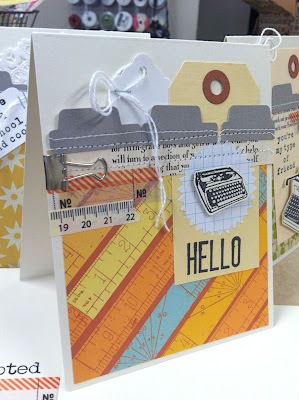 For each of my 3 cards I used 2 strips of Washi tape with a metal clip attached to the side of the card. To make those clips more flat when mailing, I used my big honkin' hammer and tapped them flat. There's just enough space to nudge them onto the side of the card. Love this little tip as it takes a lot of bulk off of the card. 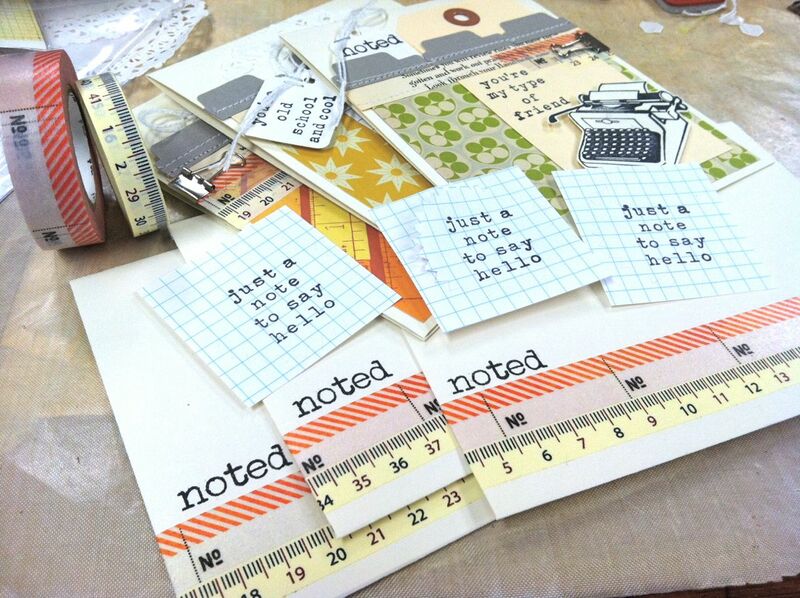 Next up I created 3 coordinating envelopes that I dressed up with strips of Washi tape and the "noted" stamp. For each envelope I used Starburst Grid Paper Labels that I stamped with a Hero Arts image. I plan to use these on the backs of the envelopes as seals. So cute! Here's the whole set of 3 cards with coordinating envelopes. And that's it for today's projects using the 2 Squared School Kit. I must now clean up my area and switch gears to Project Life. 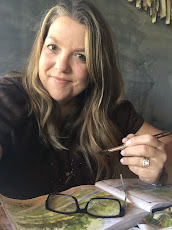 I'm SEVEN weeks behind and that's making me a little twitchy. 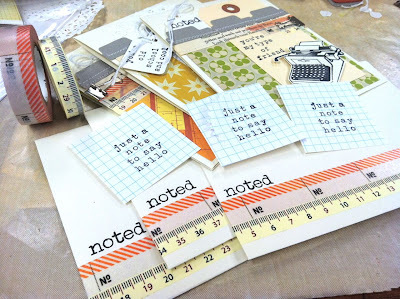 My game plan is to just start picking out my handmade journaling cards and work quickly. I have all the photos with notes in order so I just need to do a little planning. The family has some fair events they want to attend this week so I'm dedicating that time to solely work on my PL album. I'm not really into demolition derbys and rodeos. Plus it's still like 200 degrees and doesn't cool down so the air conditioning is my friend these days. Okay everyone, have a great week! Love Love LOVE your cards!!!! you are so incredibly talented, and I totally love your style! You are such an inspiration to me! =) thank you! 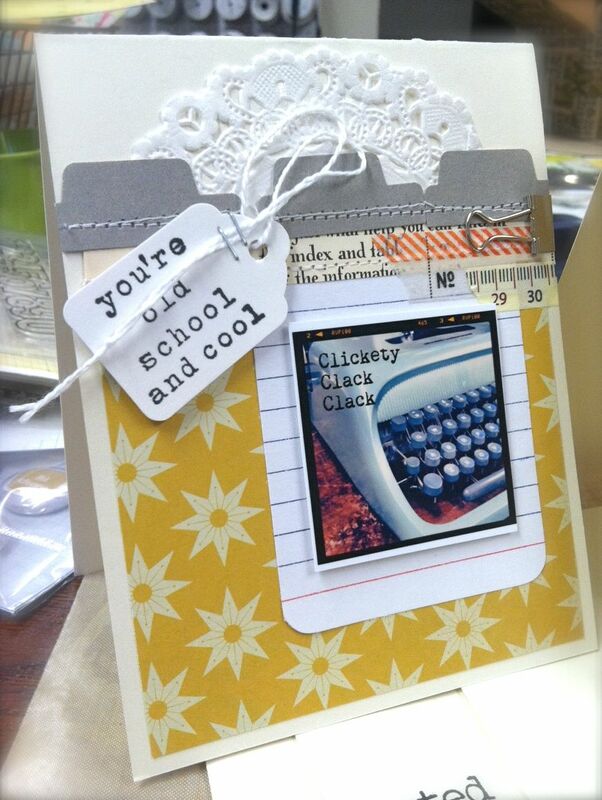 Seriously love the "You're Old School and Cool" sentiment! Cute cards! 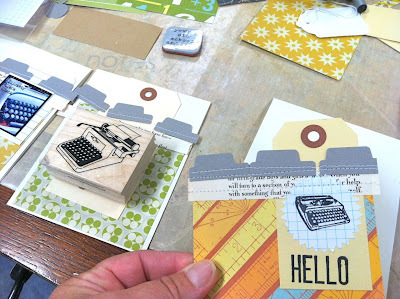 Love the design of these cards Michelle! The file tab garland and squashed binder-clip-tip are seriously amazing! this is why i fell in love with your work in the first place. your cards are so trendy and yet so old school charming. I am seriously going to give that garland a try. what a great idea!!!! 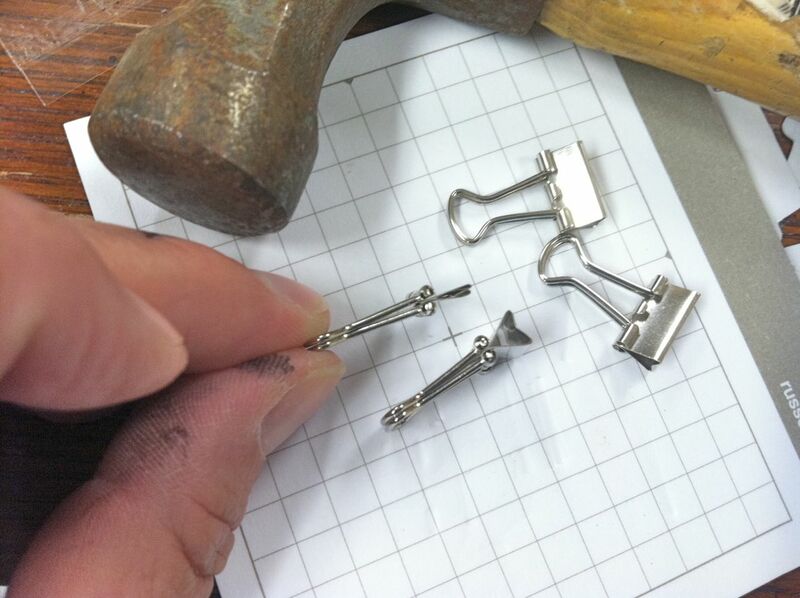 Thanks also for the tip about the binder clips. Brilliant. 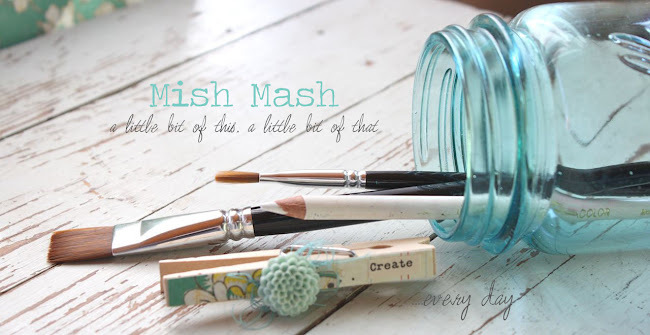 It's the little things. . .love the smashed clip hint! !